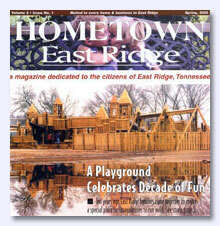 East Ridge HOMETOWN magazine was created by and for the people of East Ridge. 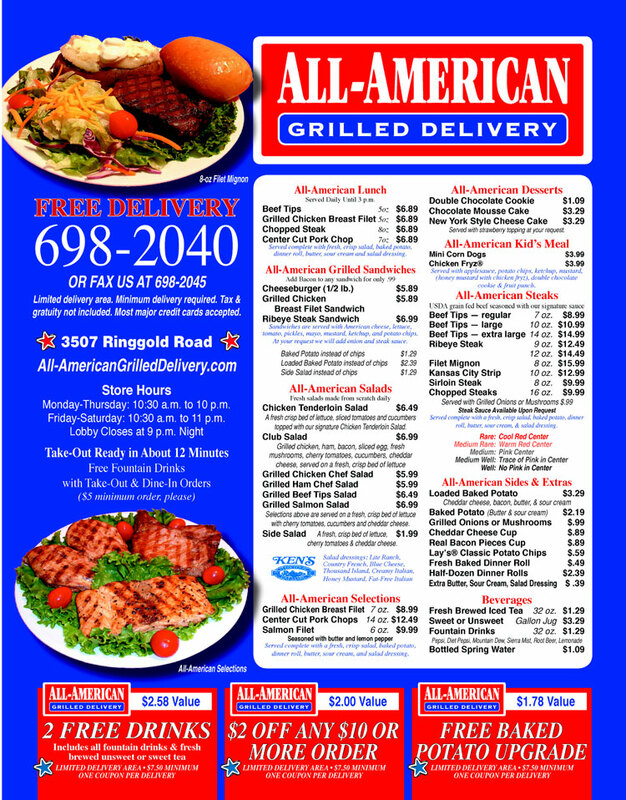 Our goal is to instill a sense of pride and participation in this great community by providing everything from general information and light-hearted reading to menus and money-saving offers. People like to do business with someone they are familiar with and our Spotlight ads allow a business to highlight their business in a different way. If you're looking for a way to position yourself as an expert in your field, and want to inform and educate people, this is for you. 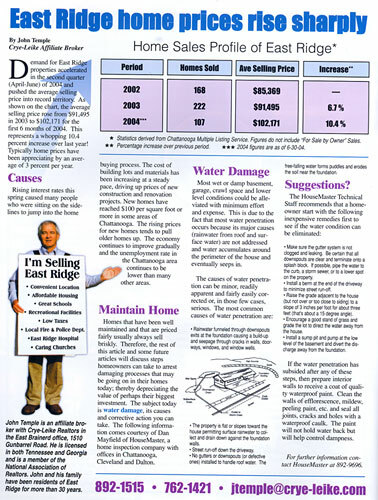 Community Information Pages (themed pages such as School, Community Information, History, etc.) Sponsorship includes a prominent banner and a 1/4 page ad elsewhere in the magazine. Artwork must be done on InDesign, Quark or Photoshop (Mac compatible). JPEG's must be high resolution and meet minimum quality requirements. Please reference in subject line "artwork" and the name of the business. For more information, please contact us at 423.320-0357. We are expanding HOMETOWN to include more informational pages. 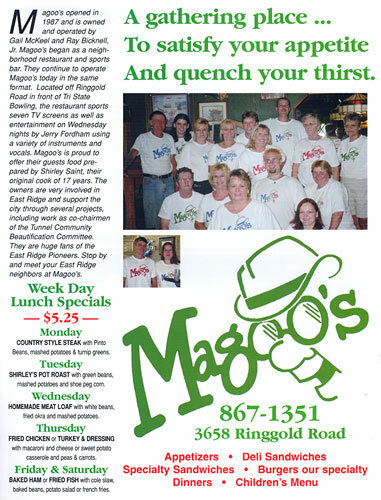 Being a community sponsor is a great way to have a presence in front of every household and business in East Ridge on a page with large readership. Your business could be the exclusive sponsor of one of these “themed” pages with a prominent presence - - PLUS you get a Quarter Page ad to tell more about yourself. 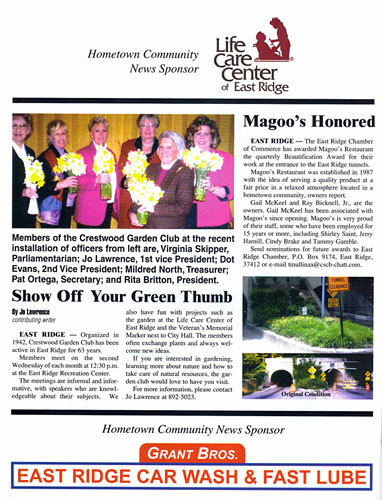 Community News Sponsor - news from the citizens of East Ridge . Chamber News Sponsor - which includes dates and times of Chamber meetings, speakers scheduled, current projects - - Plus a special section to welcome new businesses to the community (a listing which may include a photo and paragraph about their business - - compliments of the Chamber sponsor). Give us any idea you may have! $450 - Exclusive Sponsorship (includes a quarter page ad elsewhere in the magazine. Copyright , Chattanooga, TN - Hometown Marketing, Inc.